Excellent! The chapters are Famjly, Grace, Truth, Love, Humility, Time, and Eternity. The author’s engaging style and anecdotes made this a very enjoyable and thought-provoking read for me. The author keeps the focus on Jesus and salvation - very refreshing in this age of feelings and experience based Christian writing. I especially like how the author provided further reading, footnotes, and references. I will be sharing this and re-reading. This book was such an encouragement. It exhorts us to embrace the good news in our own lives and to share it with others. Redemption is real and we must not give up on that truth when witnessing to our loved ones. Christians know that it is our job to share Jesus with others. I think we also grasp that sharing the gospel with those who are closest to us can actually be hardest. Whether it is because they know us best, can hurt us easiest, or simply because we care for them most deeply, witnessing to relatives and close friends is hard work. We should be grateful to God for Randy Newman’s work on the difficult task of evangelism in the family. In Bringing the Gospel Home, Newman offers sweet and simple advice for us to follow as we try to share with our households, regardless of how healthy or broken they have been. I was particularly fond of the commonsense things that Newman shares with us in his book. For example, I was sweetly challenged to remember that everyone with whom we share the gospel is not miserable, acknowledging a God-shaped hole in their hearts. Some people feel quite happy with their lives and content with their circumstances. Newman suggests that we help those people see that God’s common grace is what allows our happiness by writing, “What a contrast to many of our efforts to first convince people how miserable they are. Paul made sure to point to how happy they were” (56). Newman goes on to say, “Why not start with joy-based apologetics instead? Why not talk to people about the good things in life that we enjoy so much—food, friends, beauty, etc., and try to see if we can point them to the Giver of such good gifts” (57). In his book, Newman is wise to challenge us to be more systematic in our approach to sharing with relatives. He would argue that we do not need to attempt to turn every conversation into a complete gospel conversation including invitation. Instead, we need to love our families, start with them where they are, and communicate truth to them based on where they are beginning. Newman writes about Paul’s pattern of sharing, “He begins with a basic primer on theology, moves on to offer insight about human nature, and then talks about Jesus. We would do well to emulate his sequence and flow of thought” (81). Newman’s work, while sweet, is also challenging. He does not compromise the gospel or ignore the importance of repentance. The author is willing to call sin what it is, and would not ask us to avoid such topics with our loved ones. However, Newman also understands that we must be wise about where, when, and how we call out others’ failings. Perhaps the Thanksgiving dinner-table conversation is not the best setting for a religious debate with an atheistic uncle. While Newman’s work does not cover every base, it is an easy read, full of encouraging true stories, which challenges me to share my faith with greater wisdom and clarity. I would recommend it to others who want to receive the same encouraging challenge. 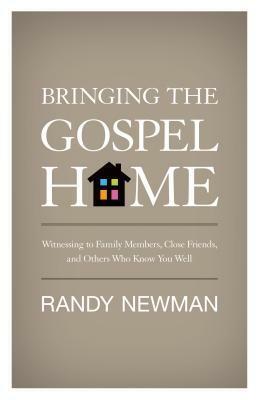 Bringing the Gospel Homeis a very helpful book for any and every Christian. Newman graciously weaves together theology, reflection, and real-life stories to help Christians at any stage in life to present the gospel with love, truth, humility, patience, and everything else that should accompany it. Newman is encouraging, not guilt-tripping; but if what you want is a list of sure-proof steps to convert your family members or friends, do not look here. However, what you receive from this book will be far more helpful than any six-step plan with a word-by-word prayer written at the end. Randy Newman will warm your spirit without giving false hope that everyone will ultimately say "Yes" to Christ. This book will help equip you to share the gospel, but only the power of the Holy Spirit will ultimately regenerate anyone and deliver them into the kingdom of life.Some of the chief gleanings I got from this book are...Love & ForgivenessTime & PatienceTrust & LiberationI recommend this book to anyone and everyone who claims Christ as Lord--even if you are not at this moment in a position when you think you need to read this book, you eventually will be. As soon as someone finds something good, they should want to share it. When that good thing is faith, there's a liberal scattering of obstacles, and when it's to people who you love, it's a real minefield. Or at least it feels like that. This book doesn't provide all the answers, and actually a lot of the suggestions and proposed conversations are very culturally bound in the US. However, it's worth a read, just because it helps you think outside the box of a very narrow understanding of what evangelism might be. I'd have preferred it to think more about loving people and how that expresses itself in sharing faith. There were some interesting stories and insights, though. A book so good, I can't believe others are not talking about. Newman writes with wisdom, experience, and a pastoral heart. This book is not a "how to," with any secret formula for evangelism. Instead, he offers biblical and even practical advice that challenges your heart to be more graceful, loving, caring, and patient. If you have any sort of relationship with someone who does not know the Lord, this book is worth the read. Amazing. This really changed my perspective on evangelizing to the population at large, not just to family members who are unsaved. I would recommend it to even those who live in solid Christian families. It's a great reminder of what sharing your faith and sharing the Gospel is and what it is not. Easy read with a lot of reminders of the power of grace. The short true stories of family and friends in a variety of peoples lives coming to faith make it useful. Newman even goes a step further and gives suggestions for those uncomfortable address certain issues. How to reach out to a segment of people that is often the most difficult, our families. Newman does a great jog of balancing grace and truth in his approach. It was great to see someone tackle this topic, especially someone who has actually witnessed to many of his own family members with success. Witnessing to family and close friends is definitely a challenge! How do you witness to a stubborn and/or abusive relative who refuses to talk about religion? How do you witness to your “prodigal” child? Randy Newman does a great job answering questions like these and more! This was a very readable and relatively short book that I recommend everyone should read if you have loved ones who don't know Christ. It offers a lot of practical steps, humorous examples of what NOT to do when sharing the gospel and a lot of encouragement in stepping up your game in evangelism. Kristen, Main patron, July 2015, 4 stars:Excellent perspective on sharing Jesus with family, including the struggles and the joys. Highly recommended. LOVED this books! More than specific practical how-to was the encouragement--not to give up praying, not to give up verbally sharing the Gospel, not to doubt God's sovereignty and perfect timing. Not really anything new for me, but encouraging and thought-provoking. On the topic of evangelism I often find testimonies to be the most helpful encouragement, and this book has a lot of them.